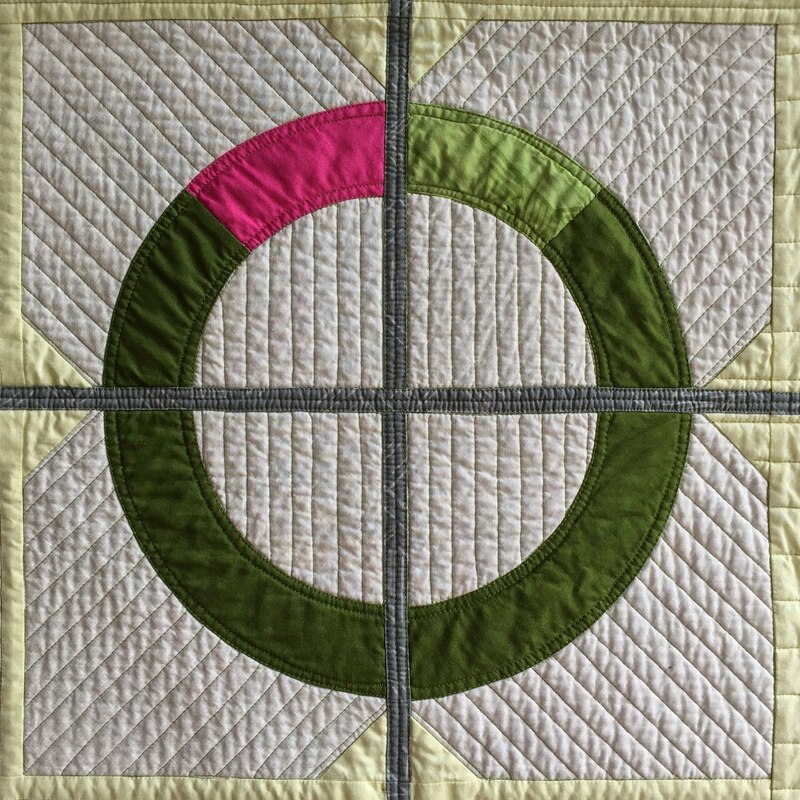 The challenge was to use Greenery as a featured color in a quilt, quilt top or mini quilt. I decided to make a quilt and in the spirit of the challenge even used contrasting green thread to quilt the entire quilt. 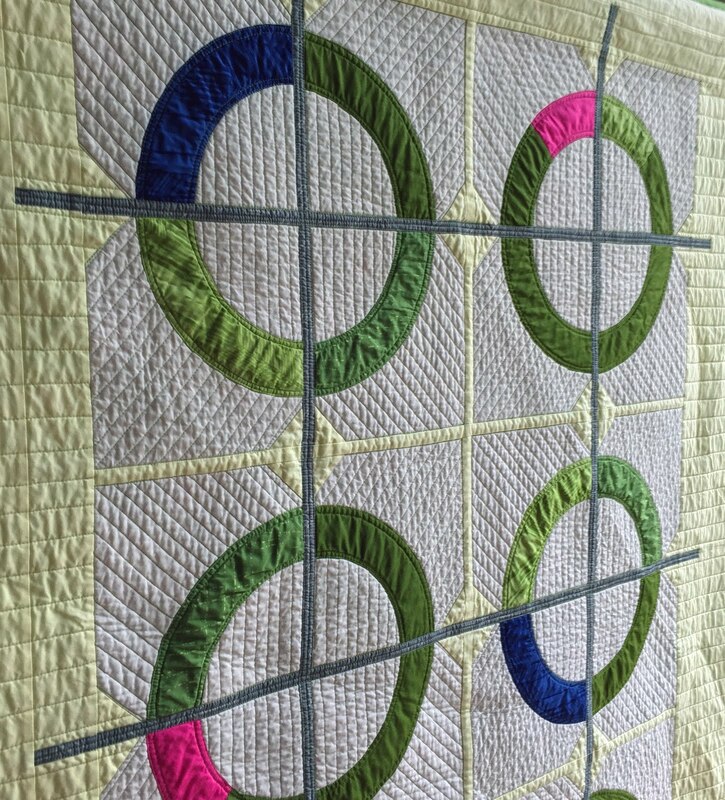 I also bound the quilt in greenery as a final splash of the inspiration color. I have to admit it took alot of positive self talk to get through quilting with a contrasting thread. Every bump, bobble, dip and slip shows up and sticks out like a sore thumb when your nose is literally 10" form the surface of the quilt. I'm very happy that I stuck with it and finished the quilt in the contrasting thread. 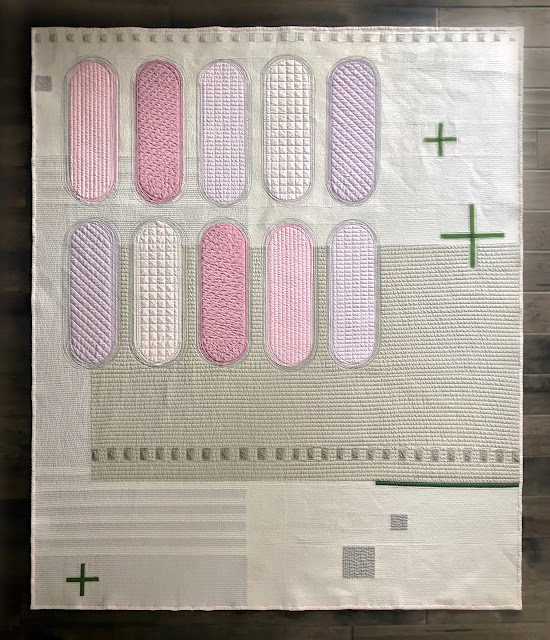 An Instagram friend commented that she loves contrast quilting on other peoples quilts but is too scared to do it on her own, she definitely put into words exactly how I felt, excellent insight Amanda (@sewsewlife)! In addition to the greenery solids I continued to challenge myself by adding some prints into the mix. I really love Me + You batiks by Hoffman Fabrics and used them again in this quilt! At the last minute I switched up the background color from aqua to a green-yellow because I really wanted the greenery to stand out. I definitely learned to stretch myself with this project and trust my design instincts and you know what it was fun!! I hope this quilt will encourage others to step out of their comfort zone even if it's just a toe. 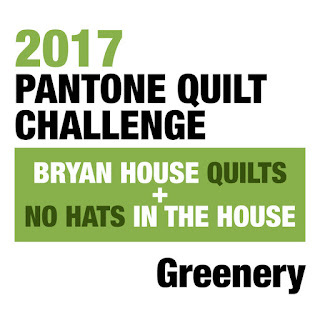 Make sure you head on over to Bryan House Quilts and check out all the amazing GREEN quilts! Finally, Modern Stepping Stones is in the Modern Quilt Guild first coffee table book, available for pre-order! 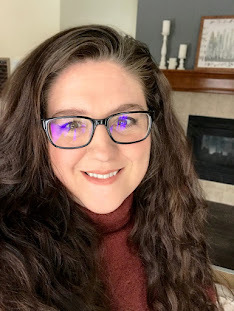 I'm still blown away that one of my quilts will be in a book and my name is on Amazon.com, listed as a contributor with some of my all time favorite quilters, whoa nelly!! 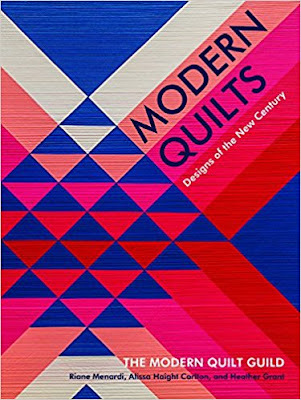 Speaking of that list, if you have ever wondered which quilters to follow on Instagram just go down this book's list of contributors, it's a great starting point and you won't be disappointed!! 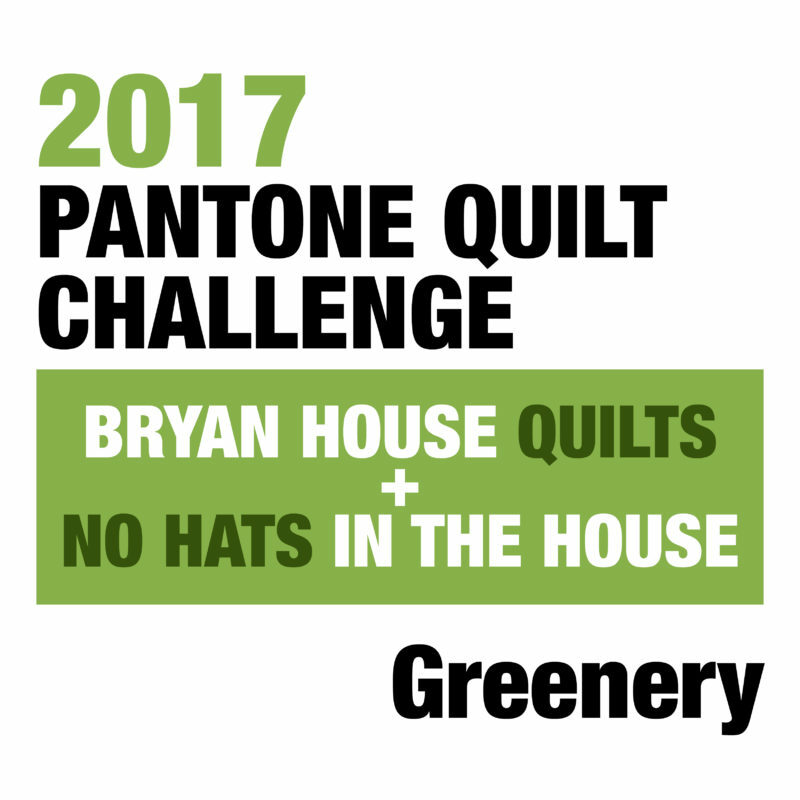 Your challenge quilt is awesome! 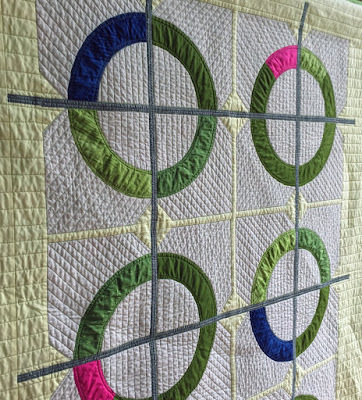 I love the design and the quilting is perfect. Thank you Cheryl! I love your Arrow Point Path for Quilt Theory. I couldn't take my eyes away from the interactions between columns, the reflection effect is very striking. This is really a lovely quilt. The design is definitely striking, but I also really love how you used the green yellow background to really let the greenery shine. Good job with the quilting! I agree about contrasting thread, but you've used it to great effect! Thanks Debbie! I love your quilt too and how all those amazing greens came together, oh and you can't ignore the beautiful setting, cedar trees are my favorite but there aren't too many of those in Spokane, mainly Ponderosa Pines. Contrasting thread was an experience all by itself!! I love your quilt! The contrasting thread works so well, glad you stuck to it! The pink splashes and print fabrics are a perfect addition to the solids! Thanks Daniela! You already know I love your entry too, so creative as usual!! 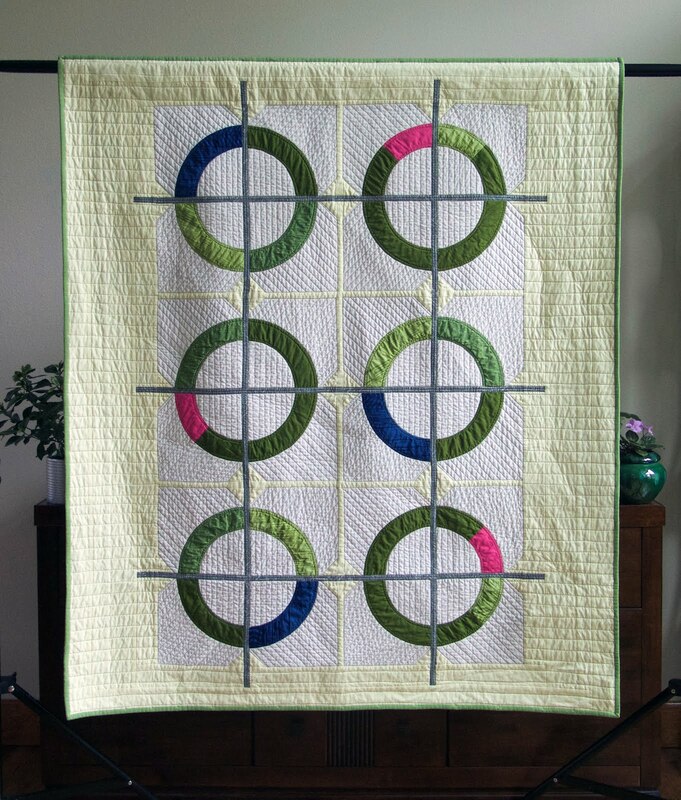 I love everything about your quilt and am glad you persevered. Thank you! I thought your Wildwood Blazes quilt was so clever and the blue is a perfect accent! So minimalist - I applaud your quilting choices for the piece. Thank you! It was definitely a step out of my comfort zone. This is a gorgeous Pantone quilt! Subtle but it really packs a punch! Beautiful quilting too! Thanks Jayne! I love your quilt too. It came together so perfectly and the quilting is amazing. Fabulous quilt -- love the design and the quilting is awesome. Thanks Stacey I loved your entry too!